OBEĆANJA, OBEĆANJA [Promises, Promises] is an exhibition/performance/installation presenting work by Rita Csapó-Sweet and Zlatko Ćosić. The art exhibition combines Csapó-Sweet's photographs, collages, and street graffiti/posters from the 2010 Bosnia and Herzegovina presidential election, combined with a sound installation by Ćosić. Additionally, Ćosić will present several of his video installations related to limited democracy, political promises, damaged privacy, surveillance, injustice, and immigration rights. 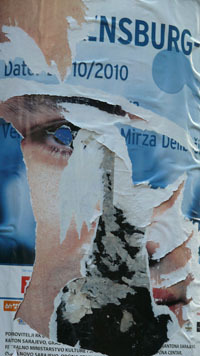 Thematically, Ćosić’s videos reinforce Csapó-Sweet's election photographs, collages, and posters. Possibility: On opening night, three performers standing on stools with megaphones will be filling the gallery space with sound bites and the poetry of election jargon. These will be related to the universality of election campaigns, speeches, debates, protests and other political and social events (in both English and Bosnian). Mixed with the political rhetoric will be verbal streaming related to the invasive nature of 21st Century public culture. All these vocalizations are presented as fragments of political speech but with the immediacy of contemporary global social movements. After opening night, the sound installation, consisting of the performers’ pre-recorded voices, will replace the performance for the remainder of the exhibition. 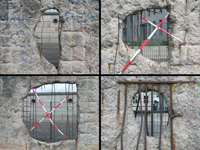 Possibility: Graffiti Wall - The exhibit contrasts election campaigns with public demonstrations. The art event becomes an interaction where the visitors become participants and have a chance to communicate by leaving a statement on a graffiti wall. The audience can participate in this public event by creating their own graffiti, statements by drawing and spray painting on a wall covered with actual political posters stripped from billboards in and around Sarajevo in October 2010. The graffiti wall will constantly change depending on input from the audience. The graffiti wall is the audience’s outlet to express themselves and continue communication about present global issues. After the show in Sarajevo in May, “Obećanja, Obećanja” [Promises, Promises] will be shown in St. Louis in November, during the US Presidential election. The St. Louis exhibition will include the Graffiti Wall. Visitors will have the opportunity to continue the dialogue about democracy and elections by adding to it.